This blog was going to be about the coming of the Robot Revolution! It was going to be about how employment opportunities will change, how industry will change, and how all of our lives will change. But then I realized……it’s already here! And not only is the robot revolution already here, it is already having an impact. I learned this by attending a public library event last weekend. My 7-year-old son was booked onto a science session on robots. And now my 7-year-old can program robots. So, the Robot Revolution is already here. But where do we go from here? Well, history is a good indicator of how these new technologies might impact the modern economy. As an example, let’s look at the impact of automated teller machines. It was initially feared that the advent of ATMs would make bank tellers redundant. 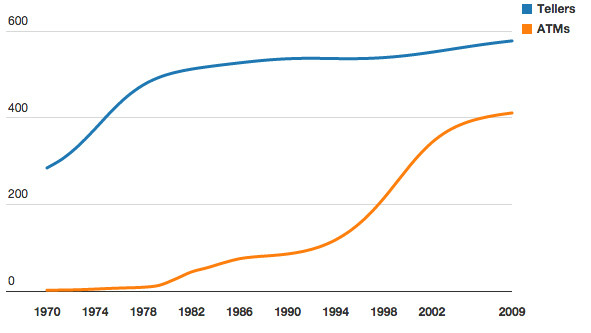 Today though, there are more bank tellers in the US ever before, according to VOX. So, the good news is that there is no shortage of new programs and projects where the outcome required is a fully ‘robotized’ solution. From construction to insurance, robots are being used ever more intensely and a program management capability is always required. Opportunities exist in almost every field, from legal to livestock, from management of fisheries to preventing phishing. The potential is huge, especially in Asia. 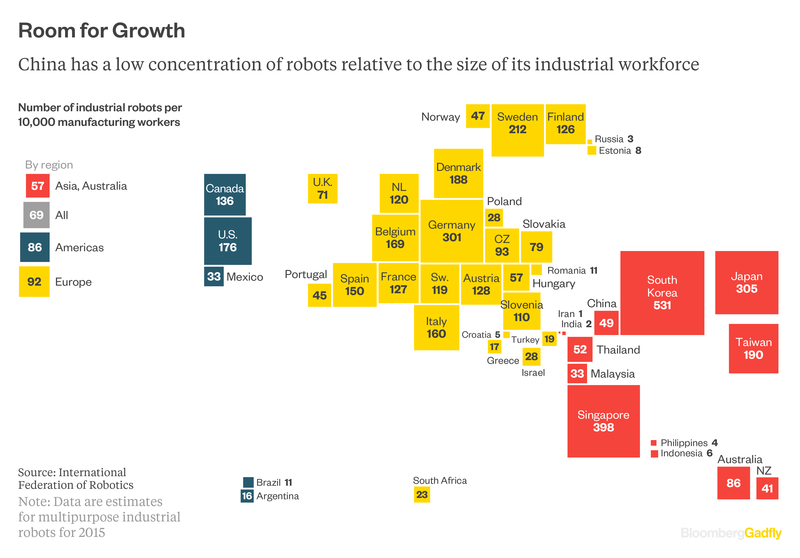 As this chart from Bloomberg (with data from the International Federation of Robotics) shows, there is massive potential in many parts of the world for increased use of robotics. Indeed, Asia, where most of the world’s population lives, has far less penetration than other areas – whereas the North America and Europe are almost evenly split. For an update on the latest in world robotics, be sure to check with the IFR. Then check here for the executive summary, but be careful, it reads like a robot has written it. Steve Harris is a Program Manager for DXC. During 24 years as a project manager and program manager, he has led sales, pre-sales and business development initiatives in both the UK and Australia. He has industry knowledge in insurance, health, utilities, public sector, finance and automotive sectors and off-shoring management experience with both India (Chennai) and Vietnam (Ho Chi Minh). He also has significant global experience, having worked and lived in France, Ireland, Canada and Australia, and having run programs in Australia, Europe and North America. Steve is an Australian Permanent Resident, having moved from the UK 4 ½ years ago. He passed his Australian citizenship exam in November 2015, and became an Australian Citizen on 8th June 2016. Steve enjoys writing and is Secretary of the Peter Cowan Writers’ Centre, based at Edith Cowan University, Joondalup Campus, Western Australia. He is also President of the Project Managers Toastmaster club based in Perth, Australia.